How to Think about Exercise helps us, as participants in the modern world, appreciate a bigger world view of exercise and sport. We spend much of our lives in a body/mind division: we toil our minds away at work while our bodies sit idle and then we exercise while our minds go blank. 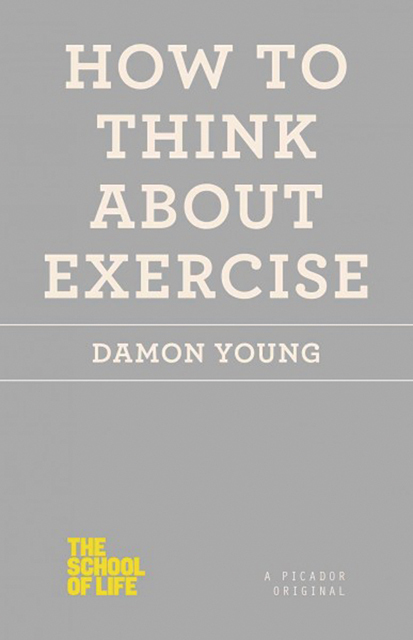 Author Damon Young challenges this body/mind separation through an engaging, sometimes humorous, discussion of the philosophical elements of fitness: reverie, pride, sacrifice, beauty, humility, pain, consistency, the sublime, and oneness. Young uses a pleasing blend of examples from the larger world and his own life to illustrate how we can unite our body and mind in exercise. As a reader, I became more aware of my exercise choices and valued them more for their attendance to mental balance. The chapters on reverie, the sublime, and oneness were attentive to the clarity of mind and spirit. For example, the simple walks of Charles Darwin were important for his health but also in the development of his ideas. Throughout the book, Young questions the reader about his/her exercise/body awareness. I found many of them helpful. Overall, How to Think about Exercise is a great little book to help keep you mindfully engaged in whatever physical activity you choose to stay physically and mentally fit.